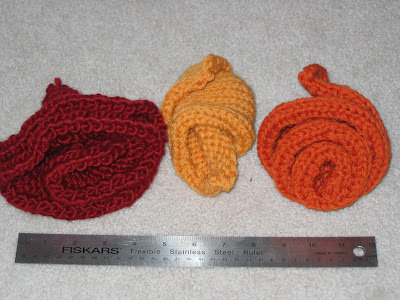 strings and purls: Kids... Don'tcha Just Love 'Em?? I didn't give much thought to the fact that today was April Fools Day. No big deal, right? Well, leave it to my students not to come to school ill-prepared. Only a few minutes into class I walked from the front of the room toward my desk, and just as I took the last step, I heard a rather suspicious sound? Looking puzzled (I know I did because of the raucaus laughter in the room) I asked, "What was that?" Silly, stupid me. That only added to their glee! Then another "sound", this one suspiciously "fart-like" in nature erupted from, well, me it sounded like, but it wasn't. Those little darlins had strategically planted an electronic "Fart Machine" under my chair when I was out of the room before school. Geniuses, I tell you... I'm working with young geniuses, here! Gotta give 'em credit; that was good! Many chuckles were had those first two periods of school. Almost funnier was third period, which is my prep. I was sitting alone in my room, working, and every once in a while another "pfhhht" would erupt. Even when they were across the hall, thoroughly absorbed in their history class, my little sweet potatoes were thinking of me! Kinda warms the cockels of your heart, don't it?!? Since I'm here I might as well post pics of a couple more FO's. 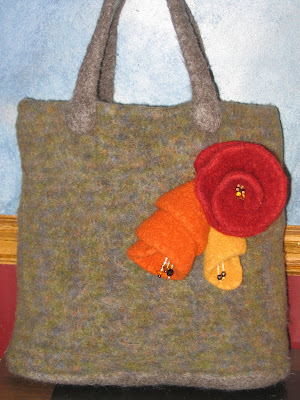 I'd made and felted this bag quite some time ago, but recently needed it for a gift so I knit up some flowers to brighten it up a bit. 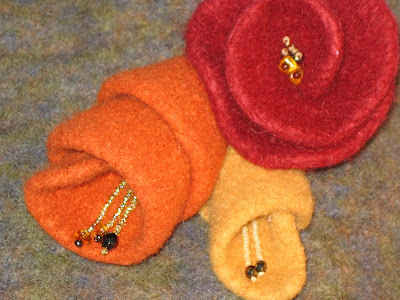 The flowers were a royal pain in the tush, as I had to cut away large chunks and sew through many tough layers of felted wool to get them into shape. Took me three hours to get the flowers put together and attached to the bag. The good news is, she loved it! I now have three friends walking around town with these bags sporting unseemingly large flowers, but they love them. They say lots of others do to, and if I would "make up a bunch" for them to carry around they could sell them for me, easy peasy! Who knew. 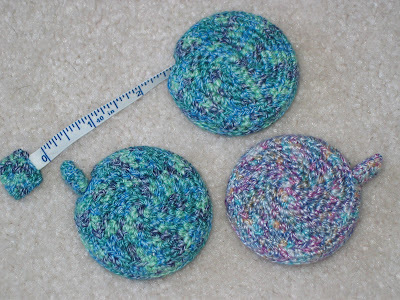 A few swaps ago I received the BEST tape measure from Chan, and knew I just had to figure out how to make them. At the time I didn't know where to get them. Anyhow, these are the little guys I came up with, and they were fun to make. Quick and easy! There are now indications that spring may come to North Dakota this year after all. Not too much snow left any more, and it was warm today... upper 30's. (Stop it.... that's not funny!!) Well, my doggies wanted to be out in the yard a bit, so I let them. I told them not to go where it's wet, but apparently they didn't 'hear' me. Came in with all eight of their snow-white feel drenched in mud, with tufts of last years dried grass sticking out from between their toes. Their punishment: Can't be in the livingroom with Mommy (and VERY light carpet) until the piggies are clean. Must stay in the family room. Life's tough when you're the family dogs! The purse is gorgeous, btw. I'd buy one! it seems in general April Fools Day was a huge hit this year, I guess everyone needed some laughter!!! Your bag is beautiful, I would be proud to carry one too!!! And the tape measures are adorable!!!! The bag is beautiful! I think it's so cute that your students played an April Fools joke on you. When I was teaching, my students would have just come to school intoxicated. Are you going to share the tape measure pattern? Wow... I can't imagine pranking a teacher. Brave kids! Love the flowers. They were worth the effort! The tape measures are darling too! I love it!!! The little darlings!!! Nate gave my Max a bath yesterday...he let him out to do the big shake...Max promptly found the largest spot of bare dirt and rolled in it until he was filthy...all we could do was laugh!